Witteveen House #1 | Historic Jacksonville, Inc.
As previously noted, the original 1-story portion of the house at 305 N. Oregon Street in Jacksonville was constructed around 1868. The 2-story portion was built almost 100 years later in 1964 by John and Elaine Witteveen. The Witteveens had moved to Jacksonville that same year and opened a color printing business. John was the photographer and printer; Elaine was the typesetter and marketer. Elaine was already an established artist and her artwork was the first thing they printed. John became a key player in the establishment of Jacksonville’s National Historic Landmark District. Elaine, a graduate of the Art Institute in Chicago, had been a founding member of the Maude Kerns Art Center in Eugene and served three years as a board member of the Oregon Arts Commission. In 1979, she pioneered the Rogue Valley Artists Workshop. John died in 1992 at age 83. In later years, the house became Elaine’s gallery as well as home. 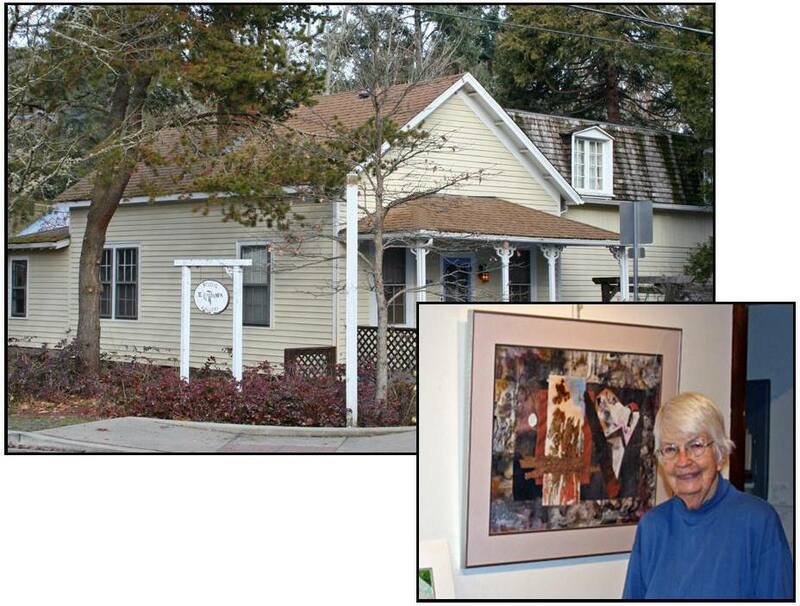 Elaine, the doyenne of Southern Oregon artists, passed away in 2015 at the age of 98.